Q What happened between Series VIII and Back to Earth? A At the end of Series VIII, the main crew consisted of Lister, a newly-resurrected version of the pre-accident Rimmer, Cat, Kryten and Kochanski. The rest of Red Dwarf's crew had also been resurrected by nanobots. As of Back to Earth, and continuing onwards to Series X, Kochanski has left the crew and Rimmer is now a hologram again. The "current" version of Rimmer appears to remember things that have happened both to the original hologram, and the Series VIII resurrected version. However, we don't know exactly which version he is, nor why he's a hologram once more. Ship's computer Holly, meanwhile, is out of commission due to waterlogging. Some of this "missing history" may yet be explored in future episodes or other media. Some of it might always remain a mystery! Q Does Back to Earth take place before or after Series X? 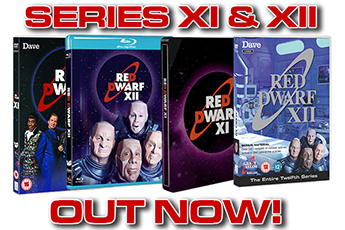 A Due to a line of dialogue in Back to Earth Part 2 - which was then also repeated on the cover of the DVD release due to it deliberately replicating the sleeve seen in the show - some fans believe that Series X is designed to serve as a "prequel" of sorts to Back to Earth. However, the "series ten" that Lister refers to in Back to Earth is a fictional series within the group hallucination taking place in the story. It bears no resemblance to the actual, later-produced Series X. Throughout Series X, Lister is searching for Kochanski, as a direct result of the events of Back to Earth, and as such it can only take place afterwards. Q What happened between Series II and III? A The fast-paced opening scrawl at the beginning of Backwards explains exactly what happened regarding Lister's pregnancy and the permanent arrival of Kryten onboard Red Dwarf. If you've never paused it on your DVD player to give it a read, go ahead and do so - or pick up the script book Son of Soup, which also includes it! 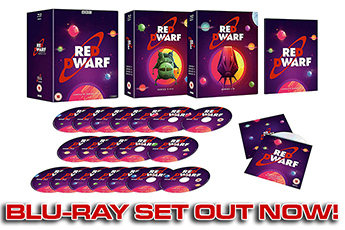 Q Has Red Dwarf ever crossed over with another TV show? A No. What's more, Red Dwarf's strict adherence to having a universe in which no aliens exist means that an official, in-continuity crossover with another sci-fi series would be unlikely. Eagle-eyed fans may have spotted a Doctor Who TARDIS model onboard the ship in certain episodes, but this was an in-joke placed there by the production crew, and not evidence of an intentional crossover! Q Have you seen this "Smeg" fridge/toaster/kettle? A Yes, we are aware of Smeg, the Italian kitchen appliance manufacturer who were founded in 1948, and whose name is coincidentally the same as the fictional futuristic swear word created by Rob Grant and Doug Naylor for use in Red Dwarf. By all means, though, keep tweeting us pictures of their goods! Q Why was [character] recast? Why did the production design change between series? A For answers to questions of this nature, please consult the vast wealth of behind-the-scenes material that exists around the show, including the series-by-series documentaries produced for the DVD and Blu-ray releases! Q I've spotted a continuity error in Red Dwarf! Can you explain it? 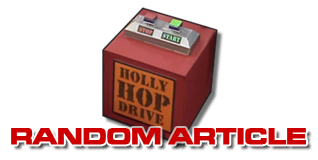 A Over the years, there has been a great deal of fan effort put in to discussing and attempting to solve assorted perceived plot quirks of Red Dwarf. We wouldn't want to spoil their fun by giving a definitive answer to any questions of this nature. Q Would anybody like any toast?